Acknowledged author Harold E. Doweiko wrote Concepts of Chemical Dependency comprising 736 pages back in 2018. Textbook and etextbook are published under ISBN 1337563455 and 9781337563451. 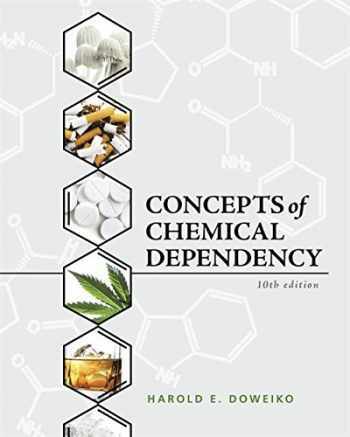 Since then Concepts of Chemical Dependency textbook received total rating of 3.5 stars and was available to sell back to BooksRun online for the top buyback price of $63.74 or rent at the marketplace. From inhalants and alcohol to synthetic drugs and opiates, CONCEPTS OF CHEMICAL DEPENDENCY, 10th Edition, reflects the explosion of information regarding the understanding, identification and treatment of substance use disorders. Author Harold Doweiko also examines the use and misuse of tobacco, barbiturates, amphetamines, cocaine and hallucinogens as well as chemicals frequently left out of other books--such as aerosols, steroids and over-the-counter analgesics. One thing you won't find is a judgmental approach preaching that "drugs are bad for you." By studying the facts and concepts in this book, you get the information you need to understand relevant research related to misused substances and help your clients overcome substance misuse challenges.